AirPlay, Apple's wireless audio and video distribution system, gets an update in OS X Mountain Lion, offering modern Macs with compatible hardware the ability to wirelessly mirror the screen to an Apple TV-attached HDTV display. AirPlay, originally named AirTunes when Apple debuted it in 2004 as a way to wirelessly stream audio from iTunes to speakers connected to the AirPort Express base station, had its name changed by Steve Jobs in 2010 after the technology was expanded to include video and photo streaming to the then-new, $99 iOS-based Apple TV. While iTunes currently has the ability to stream both audio and video playback to Apple TV, OS X can't deliver audio or video from other apps. Additionally, because AirPlay involves encryption of streamed data, it's not easy for third party developers to send data to AirPlay devices. All that is changing in Mountain Lion. The most obvious benefit is that hardware-compliant Macs can now do the same AirPlay Mirroring trick as last year's new iOS devices (iPhone 4S and iPad 2 or newer): anything on the screen can be mirrored to an Apple TV-connected display. 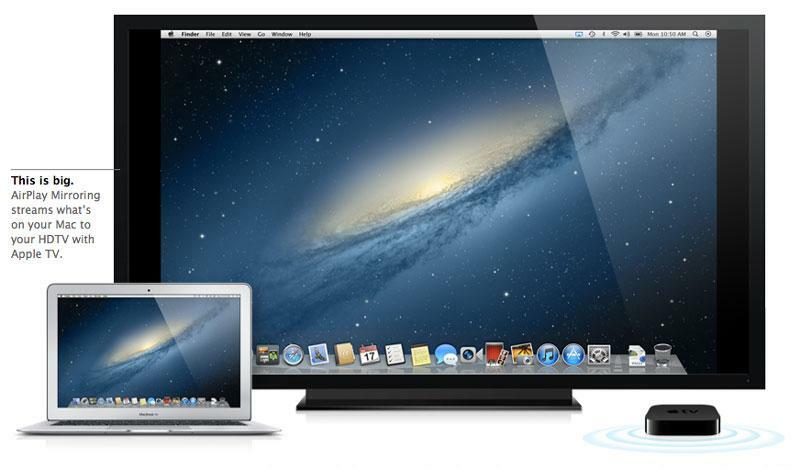 As with iOS devices, Macs need special hardware to support AirPlay Mirroring. It doesn't work on the Mid 2010 MacBook Pro, for example, but does work on early 2011 MacBook Pros, as well as mid 2011 or newer MacBook Air, iMac or Mac mini systems. These systems are the oldest machines capable of supporting AirPlay Mirroring because they are the first to deliver dedicated hardware encoding for H.264. Without a CPU capable of crunching this task using specialized hardware, earlier Macs simply can't transmit video fast enough without a lot of heat and screaming fans. Older Macs can already send video from iTunes to Apple TV via AirPlay, but they stop local playback while doing this. Mirroring requires the system to produce two video images, one driving the local display and one to be wirelessly delivered to the external screen. AirPlay doesn't just relay video from the computer (or iOS device) to Apple TV. It scales down the video to fit on an HDTV resolution, and has to convert the colorspace from the computer's RGB to the native YUV that televisions use. Both tasks require a lot of processing resources, so without the extra hardware available on newer Macs, mirroring isn't possible.